Wallbarn is a manufacturer and supplier of specialist materials for flat roofing, structural waterproofing and landscaping. As the company they produce solutions for rooftop living. The company has the most comprehensive range of pedestals for suspended paving and decking in UK. We have a reputation for offering the highest quality pedestals with unrivalled service. We supply sheet membranes for waterproofing systems as well as decking products including the innovative iDecking system. Wallbarn also produces and supplies extensive green roof systems including the modular M-Tray® sedum and wildflower green roof system. 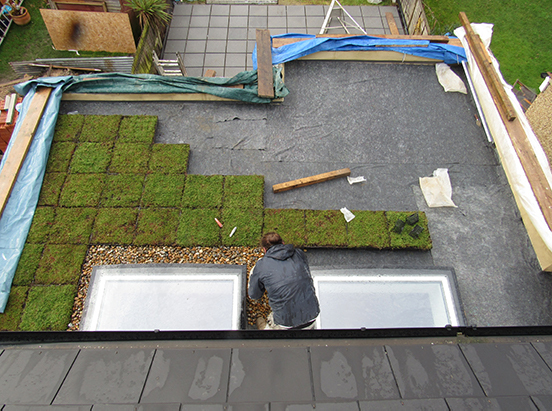 M-Tray® provides instant, sustainable green roofing, whilst being incredibly easy to install and maintain. A selection of 13 separate species of sedum suitable for the English climate is pre-grown from seeds in the trays at their nursery in Hampshire for at least 6 months. The plants, therefore have time to fully root into the substrate. Once harvested and transported to site, the plants are mature and well-established. The modules contain a mixture of ground covering and flowering sedum species. They provide year-round colour from green in the winter to a range of primary colours in the summer. In fact, several of flowering species have bee selected specifically to attract pollinators, especially bees and butterflies. These insects, in addition, encourage birds and other wildlife onto the urban rooftop environment. Thus our system helps increase biodiversity in urban areas. The single-size, self-contained trays can be carried by hand and are clipped together, creating a seamless, instant green roof. The modularity means they can be installed extremely quickly by contractors without specialist landscaping training. Furthermore, the roof is future-proofed. This allows installers if they ever need to inspect the roof to easily remove the trays. They can simply unclip and lift the trays to access the deck beneath to inspect or repair it. Wallbarn wants to help increase the amount of green spaces onto often lost flat roofs and podium decks. Even one small flat roof or podium deck transformed into a green roof helps the environment. Wallbarn, through its company’s activities want to can contribute over time to the greening of our urban spaces, significant increasing nature and improving air quality in our cities.